How do you use a library? The target is present immediately adjacent to a Protospacer Adjacent Motif (PAM). 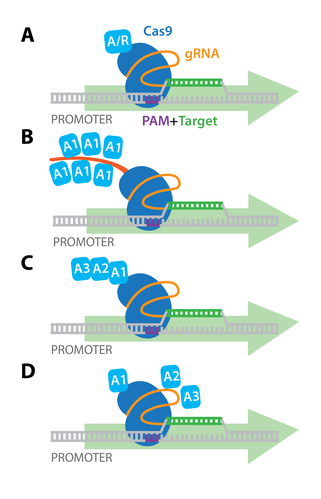 The PAM sequence is essential for target binding, but the exact sequence depends on which Cas protein you use. We'll use the popular S. pyogenes Cas9 (SpCas9) as an example, but check out our list of additional Cas proteins and PAM sequences. Once expressed, the Cas9 protein and the gRNA form a ribonucleoprotein complex through interactions between the gRNA scaffold and surface-exposed positively-charged grooves on Cas9. Cas9 undergoes a conformational change upon gRNA binding that shifts the molecule from an inactive, non-DNA binding conformation into an active DNA-binding conformation. Importantly, the spacer region of the gRNA remains free to interact with target DNA. Cas9 will only cleave a given locus if the gRNA spacer sequence shares sufficient homology with the target DNA. Once the Cas9-gRNA complex binds a putative DNA target, the seed sequence (8-10 bases at the 3′ end of the gRNA targeting sequence) will begin to anneal to the target DNA. If the seed and target DNA sequences match, the gRNA will continue to anneal to the target DNA in a 3′ to 5′ direction. The zipper-like annealing mechanics of Cas9 may explain why mismatches between the target sequence in the 3′ seed sequence completely abolish target cleavage, whereas mismatches toward the 5′ end distal to the PAM often still permit target cleavage. The Cas9 nuclease has two functional endonuclease domains: RuvC and HNH. Cas9 undergoes a second conformational change upon target binding that positions the nuclease domains to cleave opposite strands of the target DNA. The end result of Cas9-mediated DNA cleavage is a double-strand break (DSB) within the target DNA (∼3-4 nucleotides upstream of the PAM sequence). The NHEJ repair pathway is the most active repair mechanism, and it frequently causes small nucleotide insertions or deletions (indels) at the DSB site. The randomness of NHEJ-mediated DSB repair has important practical implications, because a population of cells expressing Cas9 and a gRNA will result in a diverse array of mutations (for more information, jump to Plan Your Experiment.) In most cases, NHEJ gives rise to small indels in the target DNA that result in amino acid deletions, insertions, or frameshift mutations leading to premature stop codons within the open reading frame (ORF) of the targeted gene. The ideal end result is a loss-of-function mutation within the targeted gene. However, the strength of the knockout phenotype for a given mutant cell must be validated experimentally. Learn more about non-homologous end joining (NHEJ). CRISPR specificity is partially determined by how specific the gRNA targeting sequence is for the genomic target compared to the rest of the genome. Ideally, a gRNA targeting sequence will have perfect homology to the target DNA with no homology elsewhere in the genome. Realistically, a given gRNA targeting sequence will have additional sites throughout the genome where partial homology exists. These sites are called off-targets and need to be considered when designing a gRNA for your experiment (see the Plan Your Experiment section below). In addition to optimizing gRNA design, CRISPR specificity can also be increased through modifications to Cas9. As discussed previously, Cas9 generates double-strand breaks (DSBs) through the combined activity of two nuclease domains, RuvC and HNH. Cas9 nickase, a D10A mutant of SpCas9, retains one nuclease domain and generates a DNA nick rather than a DSB. Thus, two nickases targeting opposite DNA strands are required to generate a DSB within the target DNA (often referred to as a double nick or dual nickase CRISPR system). This requirement dramatically increases target specificity, since it is unlikely that two off-target nicks will be generated within close enough proximity to cause a DSB. Therefore, if high specificity is crucial to your experiment, you might consider using the dual nickase approach to create a double nick-induced DSB. The nickase system can also be combined with HDR-mediated gene editing for specific gene edits. In 2015, researchers used rational mutagenesis to develop two high fidelity Cas9s: eSpCas9(1.1) and SpCas9-HF1. eSpCas9(1.1) contains alanine substitutions that weaken the interactions between the HNH/RuvC groove and the non-target DNA strand, preventing strand separation and cutting at off-target sites. Similarly, SpCas9-HF1 lowers off-target editing through alanine substitutions that disrupt Cas9's interactions with the DNA phosphate backbone. HypaCas9, developed in 2017, contains mutations in the REC3 domain that increase Cas9 proofreading and target discrimination. All three high fidelity enzymes generate less off-target editing than wildtype Cas9. While NHEJ-mediated DSB repair often disrupts the open reading frame of the gene, homology directed repair (HDR) can be used to generate specific nucleotide changes ranging from a single nucleotide change to large insertions like the addition of a fluorophore or tag. 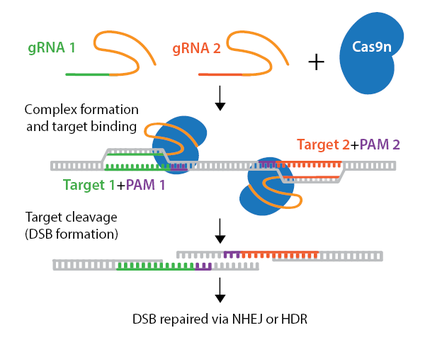 In order to utilize HDR for gene editing, a DNA repair template containing the desired sequence must be delivered into the cell type of interest with the gRNA(s) and Cas9 or Cas9 nickase. The repair template must contain the desired edit as well as additional homologous sequence immediately upstream and downstream of the target (termed left & right homology arms.) The length of each homology arm is dependent on the size of the change being introduced, with larger insertions requiring longer homology arms. Depending on the application, the repair template may be a single-stranded oligonucleotide, double-stranded oligonucleotide, or a double-stranded DNA plasmid. When designing the repair template, do not include the PAM sequence present in the genomic DNA. This step prevents the repair template from being a suitable target for Cas9 cleavage. For example, you could alter the DNA sequence of the PAM with a silent mutation that does not change the amino acid sequence. The efficiency of HDR is generally low (<10% of modified alleles) even in cells that express Cas9, gRNA and an exogenous repair template. For this reason, many laboratories try to enhance HDR by synchronizing the cells, since HDR takes place during the S and G2 phases of the cell cycle. Chemically or genetically inhibiting genes involved in NHEJ may also increase HDR frequency. Since the efficiency of Cas9 cleavage is relatively high and the efficiency of HDR is relatively low, a large portion of the Cas9-induced DSBs will be repaired via NHEJ. In other words, the resulting population of cells will contain some combination of wild-type alleles, NHEJ-repaired alleles, and/or the desired HDR-edited allele. Therefore, it is important to confirm the presence of the desired edit experimentally and to isolate clones containing the desired edit (see the validation section in Plan Your Experiment). Learn more about homology directed repair (HDR). As discussed above, the efficiency of HDR is very low due to the number of DSBs repaired by NHEJ. To make point mutations without using HDR, researchers have developed CRISPR base editors that fuse Cas9 nickase or dCas9 to a cytidine deaminase like APOBEC1. Base editors are targeted to a specific locus by a gRNA, and they can convert cytidine to uridine within a small editing window near the PAM site. Uridine is subsequently converted to thymidine through base excision repair, creating a C->T change (or G->A on the opposite strand.) This class of base editors is available with multiple Cas9 variants and using high fidelity Cas9s. In addition, new base editors have been engineered to convert adenosine to inosine, which is treated like guanosine by the cell, creating an A->G (or T->C) change. Learn more about CRISPR DNA base editors. Type VI CRISPR systems, including the enzymes Cas13a/C2c2 and Cas13b, target RNA rather than DNA. Fusing an ADAR2(E488Q) adenosine deaminase to catalytically dead Cas13b creates a programmable RNA base editor that converts adenosine to inosine in RNA (termed REPAIR.) Since inosine is functionally equivalent to guanosine, the result is an A->G change in RNA. dPspCas13b does not appear to require a specific sequence adjacent to the RNA target, making this a very flexible editing system. Editors based on ADAR2(E488Q/T375G) display improved specificity, and editors carrying the delta-984-1090 ADAR truncation retain RNA editing capabilities and are small enough to be packaged in AAV particles. CRISPR is a remarkably flexible tool for genome manipulation, as Cas enzymes bind target DNA independently of their ability to cleave target DNA. Specifically, both RuvC and HNH nuclease domains can be rendered inactive by point mutations (D10A and H840A in SpCas9), resulting in a nuclease dead Cas9 (dCas9) molecule that cannot cleave target DNA. The dCas9 molecule retains the ability to bind to target DNA based on the gRNA targeting sequence. Early experiments demonstrated that targeting dCas9 to transcription start sites was sufficient to repress transcription by blocking initiation. dCas9 can also be tagged with transcriptional repressors or activators, and targeting these dCas9 fusion proteins to the promoter region results in robust transcriptional repression or activation of downstream target genes. The simplest dCas9-based activators and repressors consist of dCas9 fused directly to a single transcriptional activator, A (e.g. VP64) or transcriptional repressor, R (e.g. KRAB; see panel A to the right). Additionally, more elaborate activation strategies have been developed for more potent activation of target genes in mammalian cells. These include: co-expression of epitope-tagged dCas9 and antibody-activator effector proteins (e.g. SunTag system, panel B), dCas9 fused to several different activation domains in series (e.g. dCas9-VPR, panel C) or co-expression of dCas9-VP64 with a modified scaffold gRNA and additional RNA-binding helper activators (e.g. SAM activators, panel D). Importantly, unlike the genome modifications induced by Cas9 or Cas9 nickase, dCas9-mediated gene activation or repression is reversible, since it does not permanently modify the genomic DNA. Cas enzymes can be fused to epigenetic modifiers like p300 and TET1 to create programmable epigenome-engineering tools. Like CRISPR activators and repressors, these tools alter gene expression without inducing double-strand breaks. However, they are much more specific for particular chromatin and DNA modifications, allowing researchers to isolate the effects of a single epigenetic mark. Another potential advantage of CRISPR epigenetic tools is their persistence and inheritance. CRISPR activators and repressors are thought to be reversible once the effector is inactivated/removed from the system. In contrast, epigenetic marks left by targeted epigenetic modifiers may be more frequently inherited by daughter cells. In certain cases, epigenetic modifiers may work better than activators/repressors in modulating transcription. However, since the effects of these tools are likely cell type- and context-dependent, it might be beneficial to try multiple CRISPR strategies when setting up your experimental system. 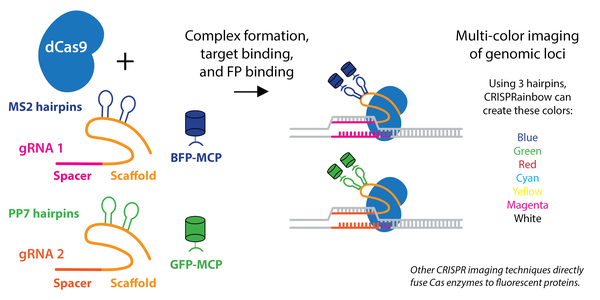 Current multiplex CRISPR systems enable researchers to target anywhere from 2 to 7 genetic loci by cloning multiple gRNAs into a single plasmid. These multiplex gRNA vectors can conceivably be combined with any of the aforementioned CRISPR derivatives to not only knock out target genes, but activate or repress target genes as well. Read more about Cas9 multiplexing and Cpf1 multiplexing. The ease of gRNA design and synthesis, as well as the ability to target almost any genomic locus, make CRISPR the ideal genome engineering system for large-scale forward genetic screening. Forward genetic screens are particularly useful for studying diseases or phenotypes for which the underlying genetic cause is not known. In general, the goal of a genetic screen is to generate a large population of cells with mutations in a wide variety of genes and then use these mutant cells to identify the genetic perturbations that result in a desired phenotype. Before CRISPR, genetic screens relied heavily on shRNA technology, which is prone to off-target effects and false negatives due to incomplete knockdown of target genes. In contrast, CRISPR is capable of making highly specific, permanent genetic modifications that are more likely to ablate target gene function. CRISPR has already been used extensively to screen for novel genes that regulate known phenotypes, including resistance to chemotherapy drugs, resistance to toxins, cell viability, and tumor metastasis. Currently, the most popular method for conducting genome-wide screens using CRISPR involves the use of pooled lentiviral CRISPR libraries. What are pooled lentiviral CRISPR libraries? Pooled lentiviral CRISPR libraries (often referred to as CRISPR libraries) are a heterogenous population of lentiviral transfer vectors, each containing an individual gRNA targeting a single gene in a given genome. Guide RNAs are designed in silico and synthesized (see panel A below), then cloned in a pooled format into lentiviral transfer vectors (panel B). CRISPR libraries have been designed for common CRISPR applications including genetic knockout, activation, and repression for human and mouse genes. Each CRISPR library is different, as libraries can target anywhere from a single class of genes up to every gene in the genome. However, there are several features that are common across most CRISPR libraries. First, each library typically contains ∼3-6 gRNAs per gene to ensure modification of every target gene, so CRISPR libraries contain thousands of unique gRNAs targeting a wide variety of genes. Guide RNA design for CRISPR libraries is usually optimized to select for guide RNAs with high on-target activity and low off-target activity. Keep in mind that the exact region of the gene to be targeted varies depending on the specific application. For example, knockout libraries often target 5′ constitutively expressed exons, but activation and repression libraries will target promoter or enhancer regions. Be sure to check the library page/original publication to see if a library is suitable for your experiment. Libraries may be available in a 1-plasmid system, in which Cas9 is included on the gRNA-containing plasmid, or a 2-plasmid system in which Cas9 must be delivered separately. How do you use a CRISPR library? 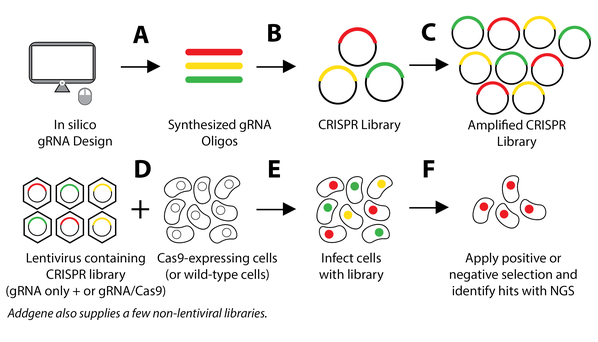 CRISPR libraries from Addgene are available in two formats: as DNA, or in select cases, as pre-made lentivirus. In the case of DNA libraries, the CRISPR library will be shipped at a concentration that is too low to be used in experiments. Thus, the first step in using your library is to amplify the library (panel C) to increase the total amount of DNA. When amplifying the library, it is important to maintain good representation of gRNAs so that the composition of your amplified library matches that of the original library. You'll use next-generation sequencing (NGS) to verify that this is the case. Learn more about library verification. Once the library has been amplified/verified, the next step is to generate lentivirus containing the entire CRISPR library (panel D). Then, you will transduce cells with the lentiviral library (panel E). Remember - if you are using a 2-vector system, you will transduce cells that are already expressing Cas9. After applying your screening conditions, you will look for relevant genes (hits) using NGS technology. For more detail on using CRISPR for both positive and negative screens, see our pooled library guide. What can screens tell you? As noted above, forward genetic screens are most useful for situations in which the physiology or cell biology behind a particular phenotype or disease is well understood, but the underlying genetic causes are unknown. Therefore, genome-wide screens using CRISPR libraries are a great way to gather unbiased information regarding which genes play a causal role in a given phenotype. With any experiment, it is important to verify that the hits you identify are actually important for your phenotype of interest. You can individually test the gRNAs identified in your screen to ensure that they reproduce the phenotype of interest. Find more information on factors to consider before starting your pooled library experiment in “Practical Considerations for Using Pooled Lentiviral CRISPR Libraries” (McDade et al., 2016). Multicolor CRISPR imaging allows for simultaneous tracking of multiple genomic loci in living cells. One method uses orthogonal dCas9s (e.g., S. pyogenes dCas9 and S. aureus dCas9) tagged with different fluorescent proteins. Alternatively, one can fuse gRNAs to orthogonal protein-interacting RNA aptamers, which recruit specific orthogonal RNA-binding proteins (RBPs) tagged with different fluorescent proteins, as seen in the popular CRISPRainbow kit. After purification of the locus, molecules associated with the locus can be identified by mass spectrometry (proteins), RNA-sequencing (RNAs), and next-generation sequencing (NGS) (other genomic regions). Compared to conventional methods for genomic purification, CRISPR-based purification methods are more straightforward and enable direct identification of molecules associated with a genomic region of interest in vivo. In bacteria, type VI CRISPR systems recognize ssRNA rather than dsDNA. Many type VI enzymes also have the ability to process crRNA precursors to mature crRNAs. Upon ssRNA recognition by the crRNA, the target RNA is degraded. In bacteria, Cas13 enzymes can also cleave RNAs nonspecifically after the initial crRNA-guided cleavage. This promiscuous cleavage activity slows bacterial cell growth and may further protect bacteria from viral pathogens. Non-specific cleavage does not occur in mammalian cells. Similar to Cas9 and Cpf1, Cas13 can be converted to an RNA-binding protein through mutation of its catalytic domain. Learn more about Cas13a. 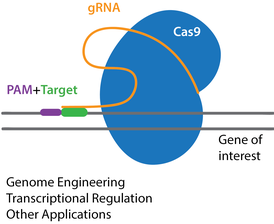 While S. pyogenes Cas9 (SpCas9) is certainly the most commonly used CRISPR endonuclease for genome engineering, it may not be the best endonuclease for every application. For example, the PAM sequence for SpCas9 (5′ NGG 3′) is abundant throughout the human genome, but an NGG sequence may not be positioned correctly to target your desired genes for modification. This limitation is of particular concern when trying to edit a gene using homology directed repair (HDR), which requires PAM sequences in very close proximity to the region to be edited. Kleinstiver et al. generated synthetic SpCas9-derived variants with non-NGG PAM sequences. Gao et al. subsequently engineered Cpf1 PAM variants. The inclusion of these variants into the CRISPR arsenal effectively doubles the targeting range of CRISPR in the human genome. Read more about Cas9 variants. Additional Cas9 orthologs from various species bind a variety of PAM sequences. These enzymes may have other characteristics that make them more useful than SpCas9 for specific applications. For example, the relatively large size of SpCas9 (∼4kb coding sequence) means that plasmids carrying the SpCas9 cDNA cannot be efficiently packaged into adeno-associated virus (AAV). Since the coding sequence for Staphylococcus aureus Cas9 (SaCas9) is ∼1 kilobase shorter than SpCas9, SaCas9 can be efficiently packaged into AAV. Similar to SpCas9, the SaCas9 endonuclease is capable of modifying target genes in mammalian cells in vitro and in mice in vivo. Another limitation of SpCas9 is the low efficiency of making specific genetic edits via HDR. For specific point edits, CRISPR base editing is a useful alternative to HDR. For larger edits, Cpf1, first described by Zetsche et al., may be a better option. Unlike Cas9 nucleases, which create blunt DSBs, Cpf1-mediated DNA cleavage creates DSBs with a short 3′ overhang. Cpf1’s staggered cleavage pattern opens up the possibility of directional gene transfer, analogous to traditional restriction enzyme cloning, which may increase the efficiency of gene editing. 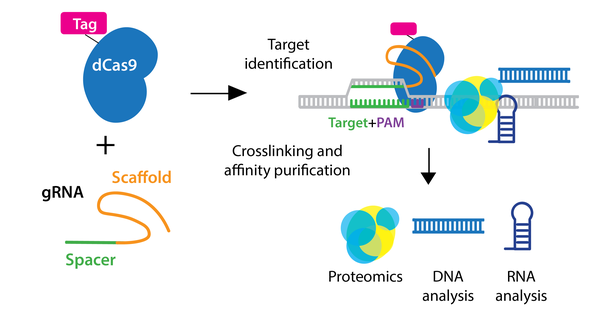 Like the Cas9 variants and orthologs described above, Cpf1 also expands the range of sites that can be targeted by CRISPR to AT-rich regions or AT-rich genomes that lack the NGG PAM sites favored by SpCas9. Generate complete and permanent loss of gene expression or function (knockout)? Generate a specific mutant allele of a gene (point mutant)? Increase or decrease expression of a target gene? Once you have a clear understanding of your experimental goal, you are ready to start navigating the different reagents that are available for your particular experiment. Different genetic manipulations require different CRISPR components. Selecting a specific genetic manipulation can be a good way to narrow down which reagents are appropriate for a given experiment. Make sure to check whether reagents are available to carry out your experiment in your particular model organism. There may not be a perfect plasmid for your specific application, and in such cases, it may be necessary to customize an existing reagent to suit your needs. Knockout Permanently disrupt gene function in a particular cell type or organism without a specific preferred mutation Cas9 (or Cas9 nickase) Single (or dual) gRNA targeting 5′ exon or essential protein domains High-fidelity Cas enzymes increase specificity. Dual-nickase approach increases specificity but is less efficient. Each putative knockout allele must be experimentally verified. Edit Generate a specific user-defined sequence change in a particular gene, such as generating a point mutation or inserting a tag Cas9 (or Cas9 nickase); Base editor Single (or dual) gRNA targeting the region where the edit should be made HDR requires a repair template and displays reduced efficiency compared to NHEJ knockout. Base editors can make a limited set of mutations. Repress or Interfere (CRISPRi) Reduce expression of a particular gene(s) without permanently modifying the genome dCas9-repressor (such as dCas9-KRAB) or dCas9 gRNA(s) targeting promoter elements of target gene dCas9-KRAB is more effective than dCas9 alone for mammalian cell lines. Activate (CRISPRa) Increase expression of an endogenous gene(s) without permanently modifying the genome dCas9-activator (such as dCas9-VP64) gRNA(s) targeting promoter elements of target gene Many different activators exist, including the multi-plasmid SAM system. To use CRISPR, you will need both Cas9 and a gRNA expressed in your target cells. For easy-to-transfect cell types (e.g. HEK293 cells), transfection with standard transfection reagents may be sufficient to express the CRISPR machinery. For more difficult cells (e.g. primary cells), viral delivery of CRISPR reagents may be more appropriate. In cases where off-target editing is a major concern, Cas9-gRNA ribonucleoprotein (RNP) complexes are advantageous due to the transient Cas9 expression. RNA delivery of Cas9 and gRNA In vitro transcription reactions generate mature Cas9 mRNA and gRNA, which are then delivered to target cells through microinjection or electroporation. Once you have selected your CRISPR components and method of delivery, you are ready to select a target sequence and design your gRNA. When possible, you should sequence the region you are planning to modify prior to designing your gRNA, as sequence variation between your gRNA targeting sequence and target DNA may result in reduced cleavage. The number of alleles for each gene may vary depending on the specific cell line or organism, which may affect the observed efficiency of CRISPR knockout or knockin. To activate or repress a target gene using dCas9-activators or dCas9-repressors, gRNAs should be targeted to the promoter driving expression of your gene of interest. For genetic knockouts, gRNAs commonly target 5′ constitutively expressed exons, which reduces the chances that the targeted region is removed from the mRNA due to alternative splicing. Exons near the N-terminus are targeted since frameshift mutations here increase the likelihood that a nonfunctional protein product is produced. Alternatively, gRNAs can be designed to target exons that code for known essential protein domains. The benefit of this approach is that even non-frameshift alleles may alter protein function when they occur in important protein domains. For gene editing experiments using HDR, it is essential that the target sequence be very close to the location of the desired edit, ideally less than 10 bp away. In this case, it is necessary to identify the exact location where the edit should occur and select a target sequence nearby. 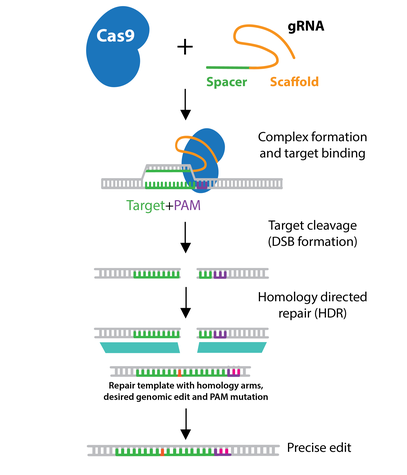 A PAM sequence is absolutely necessary for Cas9 to bind target DNA. As such, one can start by identifying all PAM sequences within the genetic region to be targeted. If there are no PAM sequences for your chosen enzyme within your desired sequence, you may want to consider alternative Cas enzymes (see Cas9 variants and PAM sequences). Once possible PAM sequences and putative target sites have been identified, it is time to choose which site is likely to result in the most efficient on-target cleavage. The gRNA target sequence needs to match the target locus, but it is also critical to ensure that the gRNA target sequence does NOT match additional sites within the genome. In a perfect world, your gRNA target sequence would have perfect homology to your target with no homology elsewhere in the genome. Realistically, a given gRNA target sequence will have partial homology to additional sites throughout the genome. These sites are called off-targets and should be examined during gRNA design. In general, off-target sites are not cleaved as efficiently when mismatches occur near the PAM sequence, so gRNAs with no homology or those with mismatches close to the PAM sequence will have the highest specificity. To increase specificity, you can also consider using a high-fidelity Cas enzyme. In addition to off-target activity, it is also important to consider factors that maximize cleavage of the desired target sequence or on-target activity. Two gRNA targeting sequences with 100% homology to their DNA targets may not result in equivalent cleavage efficiency. In fact, cleavage efficiency may increase or decrease depending upon the specific nucleotides within the selected target sequence. For example, gRNA targeting sequences containing a G nucleotide at position 20 (1 bp upstream of the PAM) may be more efficacious than gRNAs containing a C nucleotide at the same position in spite of being a perfect match for the target sequence. Many gRNA design programs can locate potential PAM and target sequences and rank the associated gRNAs based on their predicted on-target and off-target activity (see gRNA design software). Additionally, many plasmids containing validated gRNAs are now available through Addgene. These plasmids contain gRNAs that have been used successfully in genome engineering experiments. Using validated gRNAs can save your lab valuable time and resources when carrying out CRISPR experiments. Read more about how to design your gRNA. Once you have selected your target sequences it is time to design your gRNA oligos and clone these oligos into your desired vector. In many cases, targeting oligos are synthesized, annealed, and inserted into plasmids containing the gRNA scaffold using standard restriction-ligation cloning. 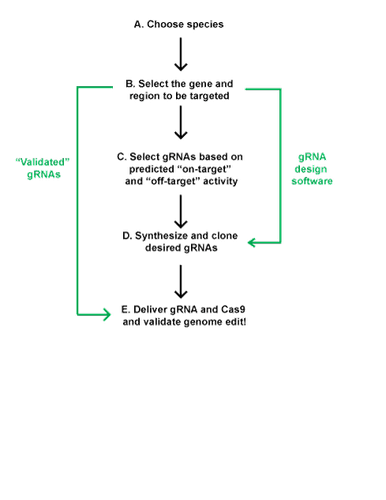 However, the exact cloning strategy will depend on the gRNA vector you have chosen, so it is best to review the protocol associated with the specific plasmid in question (see CRISPR protocols from Addgene depositors). Choose a delivery method that is compatible with your experimental system. CRISPR efficiency will vary based on the method of delivery and the cell type. Before proceeding with your experiment, it may be necessary to optimize your delivery conditions. Learn more about CRISPR delivery in mammalian systems. Once you have successfully delivered the gRNA and Cas enzyme to your target cells, it is time to validate your genome edit. CRISPR editing produces several possible genotypes within the resulting cell population. Some cells may be wild-type due to either (1) a lack of gRNA and/or Cas9 expression or (2) a lack of efficient target cleavage in cells expressing both Cas9 and gRNA. Edited cells may be homozygous or heterozygous for edits at your target locus. Furthermore, in cells containing two mutated alleles, each mutated allele may be different owing to the error-prone nature of NHEJ. In HDR gene editing experiments, most mutated alleles will not contain the desired edit, as a large percentage of DSBs are still repaired by NHEJ. Mismatch-cleavage assay (for NHEJ repaired DSBs): Provides a semi-quantitative readout of the percentage of alleles that have been mutated within a mixed cell population. The region of interest is PCR amplified, PCR products are denatured-renatured, treated with a nuclease that cleaves DNA heteroduplexes, and run on an agarose gel to identify DNA fragments. PCR and restriction digest (for HDR repaired DSBs): For small nucleotide edits that introduce a novel restriction site. The region of interest is PCR amplified, digested with the appropriate restriction enzyme and run on an agarose gel to identify DNA fragments. PCR amplification and gel electrophoresis (for HDR or NHEJ): For large deletions or insertions, the region of interest can be PCR amplified using primers that (A) flank the region of interest (deletions or small insertions) or (B) span the genome-insert boundary (insertions only). The PCR product is then run on an agarose gel to determine whether the edit was successful. PCR amplification, subcloning and Sanger sequencing (for HDR or NHEJ): Provides semi-quantitative assessment of targeting frequency and exact sequence of targeted alleles. Involves PCR amplification of targeted region from DNA, subcloning into a plasmid, and screening individual clones. PCR amplification and next-generation sequencing (for HDR or NHEJ): Provides quantitative assessment of the genome edits in your target sequence and can also be used to examine off-target effects. More information on each of these techniques can be found in our blog post CRISPR 101: Validating your Genome Edit. The majority of the CRISPR plasmids in Addgene’s collection are from S. pyogenes unless otherwise noted. gRNA Guide RNA, a synthetic fusion of the endogenous bacterial crRNA and tracrRNA that provides both targeting specificity and scaffolding/binding ability for Cas9 nuclease. This synthetic fusion does not exist in nature and is also commonly referred to as an sgRNA. Nickase Cas9 with one of the two nuclease domains inactivated. This enzyme is capable of cleaving only one strand of target dsDNA.